Trumba Connect has great flexibility and is scalable enough to be used by a single user to the largest customer with thousands of users. Trumba's advanced technology provides all the tools you need to publish design quality calendars with easy integration in your website with your branding and style preferences. 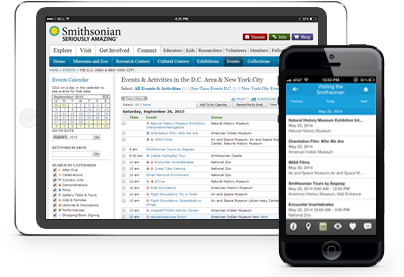 Our powerful search and promotion tools help your audience find the events they care about. It's Powerful! But I don't look forward to working in it. Pros: It has SO many features, you will likely be able to do anything you want to do with a calendar. That's what my organization uses it for. You can set up a form for people to submit events, but have those submitted events go to calendars for review (not on your website) and then you can move them to actual calendars on your website. That saves time and is a very convenient feature! There are lots of spuds available, and they are very reliable. Overall: You can do nearly anything imaginable with this calendaring software. I really like that people can submit their own events for me to review before publishing, which saves me SO much time. We love Trumba for calendaring and syncing the calendars to our webpage. Pros: Trumba is very easy to use and the data entry component is quick. Making revisions or changes is also very user friendly and hassle free. Cons: The color legend to ID certain items is off sometimes on the admin side (only complaint I have) so it makes it difficult to differentiate the data we are looking at. Overall: The customer service is great and we are able to customize the software with the support of Trumba's IT with no problem.